Paul Feyerabend (born 13 January 1924, died 11 February 1994) is best-known for his contributions to the philosophy of science, which is somewhat ironic because, I suspect, he wouldn’t have thought of himself as a philosopher of science. I don’t just mean he wouldn’t have thought of himself as just a philosopher of science. No, I mean that he thought of himself as a thinker for whom disciplinary boundaries meant absolutely nothing. In his later years, he even denied being a philosopher. But right from the time when he really found his feet as an independent thinker (independent of those philosophers under whom he had studied and worked), Feyerabend’s tendency was to range over enormous swathes of human thought, without regard to their supposed differences and boundary-lines. This is partly why in his books and articles one encounters not only the usual philosophical suspects, but a huge range of thinkers including scientists of every persuasion (of course), the Church fathers, the authors of the Malleus Maleficarum, historians, playwrights, poets, political thinkers, anthropologists, and astrologers. (It’s this quality of enormously wide intellectual range, I have to say, which first attracted me to his works). One of the reasons Feyerabend came to despise contemporary philosophy was undoubtedly that it no longer features, and perhaps can no longer really feature, the sorts of figures he most admired, such as his fellow boundary-striders Ludwig Boltzmann, Ernst Mach and Albert Einstein, for whom the expression ‘philosopher-physicists’ was invented. It’s also ironic because although Feyerabend was a fervent admirer of certain scientists, he also supplied, or canonised, a perspective on knowledge which gives science no special or privileged place. This was cemented fairly early on in the book which made his name, Against Method (1975), in which he put forward the idea that there is no scientific method, partly because the greatest scientists have been nimble, opportunistic thinkers who, despite pretending to follow the kind of methodological rules that philosophers and science textbooks posit, were always prepared to cast them aside when they got in the way. Although Feyerabend had some influence on important figures within the philosophy of science, such as Bas van Fraassen, Ronald Giere, and John Dupré, the real impact he made was outside philosophy, since he became known in other disciplines as an ‘epistemological anarchist’, and the idea that a philosopher of science could have that reputation gave impetus to relativistic tendencies of many different kinds outside philosophy, for example in archaeology. 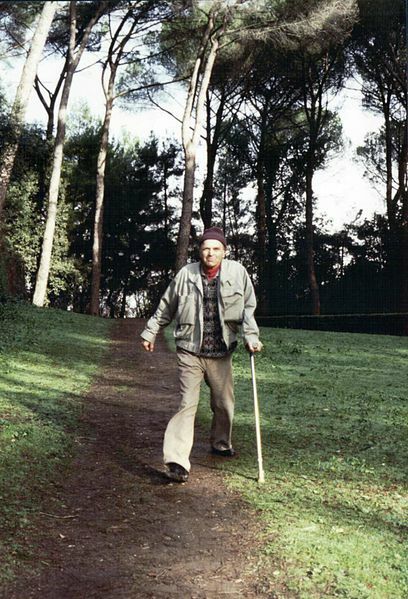 Paul Feyerabend enjoying a stroll in Rome, Italy. Attributed to Grazia Borrini-Feyerabend via Wikimedia Commons. This reputation itself gave rise to the accusation that Feyerabend was ‘the worst enemy of science’ (Theocharis, T. & Psimopoulos, M., “Where Science Has Gone Wrong”, Nature, 1987, p.596). He certainly didn’t mean to be that, and his fans have enthusiastically sought to defend him from this accusation. One can see where the critics are coming from, though. For the way in which Feyerabend envisages evaluating science is somewhat unusual. His work seems to disallow, or at least discourage, any attempt to evaluate different approaches, including science, in genuinely epistemic terms. That is, he was deeply sceptical of any attempt to say that one approach, or theory, constituted knowledge where another was mere opinion. And this scepticism extended, I believe, even to much more qualified terms of epistemic appraisal, such as claims that one approach or theory was better epistemically justified than, or more probably true than, or even just closer to the truth than, another. However, this doesn’t mean that Feyerabend envisaged no way of evaluating approaches. Rather, he encouraged us to evaluate approaches, including science, in terms of their contribution to human happiness. I worry that although one might apply this suggestion at a very general level, to the comparative evaluation of world-views, it doesn’t really tell us anything about how to evaluate different theories within science. I also worry that as well as being too hard on science (since some people will inevitably reject science on its basis), Feyerabend’s suggestion is also too soft on it. Feyerabend was, especially in later works such as The Tyranny of Science (2011) a foe of ‘scientism’, the belief that science has the resources to answer all significant human questions. But because of his marked allergy to disciplinary boundaries, he didn’t have one of the main planks of what I think of as the most plausible case against scientism, the idea that there are very different kinds of questions, and thus that considerations from one field can’t always be used to address questions in another field. Those of the scientistic persuasion, though, can quite well argue that, having plumped for the scientific world-view on the basis of its contribution to human happiness, they not only accept it in its entirety but also that they find this world-view capable of answering all meaningful questions. In other words, scientism seems to be able to legitimise itself in terms of Feyerabend’s suggestions. Thus, I find myself torn between admiration for Feyerabend, and the feeling that his philosophy can’t really supply ammunition against those who, like some leading contemporary advocates of the most militant kind of scientism and atheism, think there are no real questions outside science or against those who, like Steven Hawking, think philosophy has been superseded by science. Featured Image credit: Title page of Malleus Maleficarum (Hammer of Witches) by H. Institutoris, a widely-read medieval text on the extermination of witches. Wellcome Images, CC BY 4.0 via Wikimedia Commons. John Preston is Professor and Departmental Director of Teaching and Learning in the Philosophy department at the University of Reading. His main research interests are in the history of philosophy (especially late nineteenth and early-to-mid-twentieth-century philosophers), philosophy of science, philosophy of mind, and in epistemology. He is currently on the Honorary Committee of the British Wittgenstein Society and a member of the Council of the Royal Institute of Philosophy. He is the author of the Paul Feyerabend article for Oxford Bibliographes in Philosophy. There’s a seeming contradiction in the definition of scientism. Despite the fact that scientism claims that only meaningful questions are worth answering, proponents of such a worldview constantly cross demarcation boundaries to comment on and criticise metaphysical, psychological and emotional experiences. The real definition of scientism is that it believes that all questions can be answered in a scientific way, why we love, why we have consciousness, what is the meaning of life. The aim of any critique of it is to show that it is a faith-based position like any other, which doesn’t negate the achievements of the scientific method, just recognises it is merely one facet of human experience. Yes, I agree, scientism can well be defined in that way, and is then subject to that kind of objection. But the very idea of ‘disciplinary boundaries’ is increasingly unpopular and challenged, not least in philosophy, where people no longer see any significant difference between philosophy and science, for example. While an admirer of Feyerabend and the sentiments expressed here, I must admit that I sometimes find related discussions a little confusing re. use of the terms ‘scientism’ and ‘naturalism’. The only difference I can really make out is that the former is typically used pejoratively while the latter is more often used admiringly. Are there significant differences in the definitions of these terms and would a clarification of those help elucidate the commitments that are at issue ?